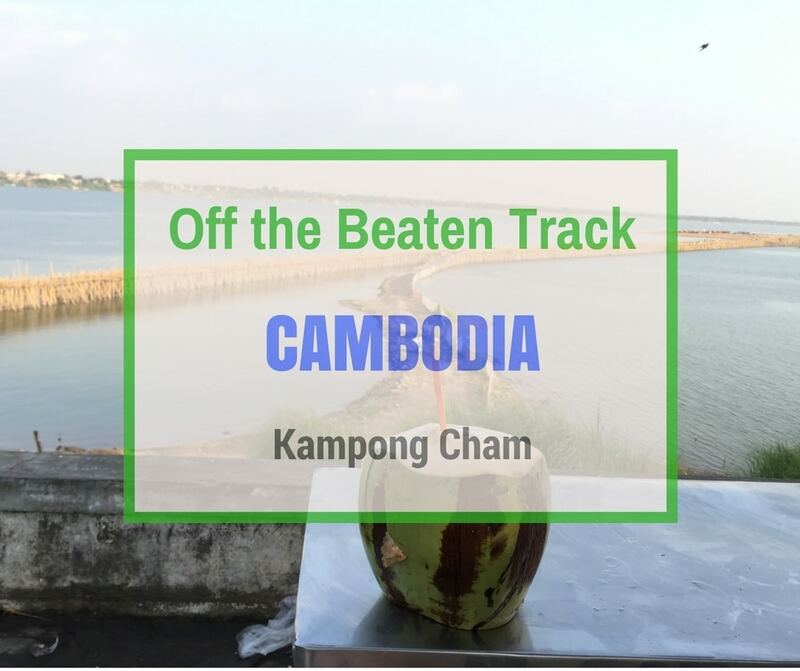 Welcome to the second in our ‘Off the Beaten Track‘ Cambodia series. 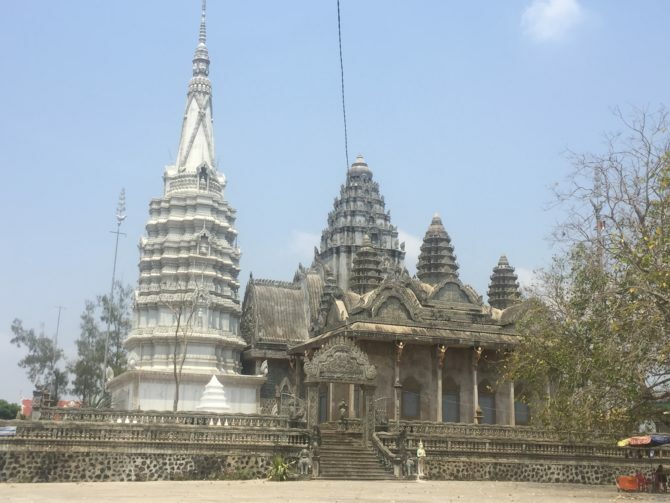 As explained in the first instalment – Off the Beaten Track Cambodia – Kulen Mountain Day Trip, we’re trying to visit somewhere off the beaten track every month. We hope to encourage people to stay longer in Cambodia and see what it has to offer away from the tourist hoards. In March I took a solo five-day trip to Kampong Cham and Kratie; Andy stayed in Siem Reap as he had to work. First stop on my mini adventure was Kampong Cham. Situated on the River Mekong in eastern Cambodia is the quaint, sleepy riverside town of Kampong Cham. This charming laid-back town rarely makes it onto Cambodia travel itineraries and if it does it’s often just to break up the journey to other destinations. One of the first things I noticed as I walked to my hotel was that the streets and sidewalks away from the main town and riverfront were very clean and well maintained. Kampong Cham has a very different feel compared to Siem Reap and Phnom Penh. It has fewer tuk tuks, fewer motos, considerably less pollution and litter, and lacks the hustle and bustle of the touristy cities of Cambodia. At first glance, there really doesn’t seem to be much to do in Kampong Cham. However scratch the surface and there’s more than enough to keep you occupied for a couple of days, maybe even longer if you venture further afield into the surrounding countryside. During my visit, I was on the go pretty much constantly which is usual for me when travelling solo. I managed to fit in many of the things that there are to see and do both in the town and within cycling distance of it. You could while away several hours just wandering around Kampong Cham. Explore the main street lined with bright, but worn colonial buildings and the streets leading back from the Mekong. Every so often as you glance down a side street, a shimmer of the river will catch your eye. A leisurely stroll along the waterfront between the concrete Kizuna Bridge and Koh Paen Bamboo Bridge is not to be missed. The entire length of the riverside is lined with a wide paved promenade, dotted with brass and stone statues, neat grassy areas, palms and flowering trees. Towards the bamboo bridge, a selection of local food and drink stalls are set up. As evening approaches the whole waterfront becomes busy with locals taking a walk, taking an aerobics class, socialising, or sharing some local delicacies and drinks. 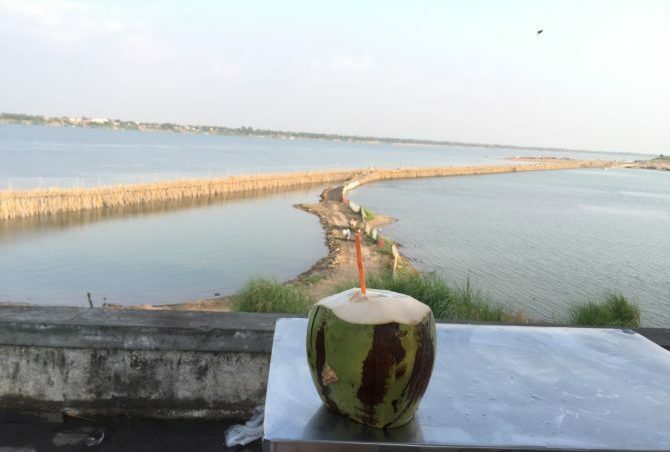 It’s a perfect spot to enjoy a refreshing coconut, watch the sun set over the Mekong, and listen to the tinkling bells of the horse and carts as they trot along the road. 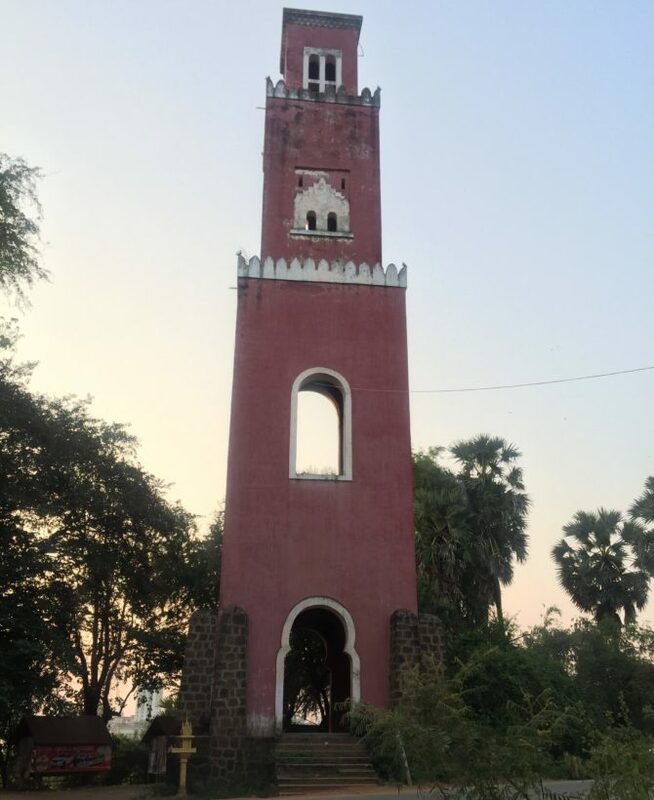 Set overlooking the Mekong at the far side of the concrete Kizuna Bridge, a 19th Century Colonial French watch-tower stands tall above the jungle below. I took the long walk over the bridge in the hope of climbing the tower in time for the sunset over the Mekong. Once I’d entered the reddy, pink-walled tower and looked up at the green metal staircase I nearly had second thoughts. I hadn’t realised the steps were going to be that steep…only a few degrees short of a ladder. Not being a fan of steps and stairs and after a nasty fall down some treacherous beach bungalow steps a couple of months previously, I had to persuade myself to climb them. Once at the top, the fear left me and the view made it worthwhile. The tower looks out over Kampong Cham town, the lazy Mekong, and the green lowlands. The view is only hindered by the tangled power lines which are easy to forget when the sun starts to set. If you have a spare couple of hours to kill I really think it’s worth a visit unless you have a fear of heights, then maybe don’t bother. 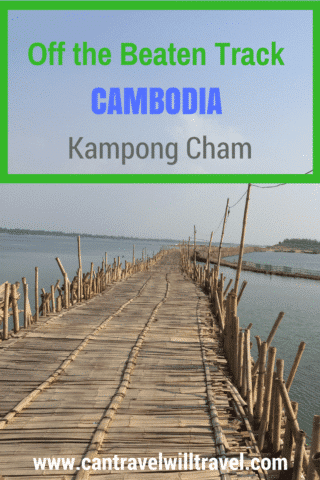 What first caught my attention about Kampong Cham and made me want to visit was that I’d heard it was home to the longest bamboo bridge in the world, Koh Paen Bridge. The bridge stretches about 300 metres from the mainland to Koh Paen Island. Constructed entirely from bamboo (plus some twisted wire to hold it together) it’s strong enough to take the weight of a small car. The bridge is rebuilt by hand from scratch at the beginning of every dry season (usually around December), then dismantled and stored away just before the wet season in June. This prevents it from being washed away by high waters in the middle of wet season. It costs $1 USD (£0.80 GBP) per person (less for locals) for a return crossing of the bridge, which you can do by foot, bicycle or motorcycle, tuk tuk or small car. I’d rented a bicycle so nervously decided to attempt to cycle across it. People have been known to come off bicycles and motos as they crossed the bridge so I was a little unsure about the whole thing. It required my full concentration to stay upright on the uneven, springy surface, and to not career off the un-railed edge into the depths of the Mekong. Despite this, it actually turned out to be one of the highlights of my visit to Kampong Cham, slightly scary but exhilarating. It seems that, that 2016 – 2017 build of the Koh Paen Bridge would be the last as it was due to be replaced soon with a permanent concrete version. I’m really happy I got to experience the longest bamboo bridge in the world before that happens. If you’re longing for a relaxing couple of hours, or a morning or afternoon, then a leisurely cycle ride around Koh Paen Island is hard to beat. Linked to the southern reaches of Kampong Cham by the intricate Koh Paen Bamboo Bridge, this island is really a very large village. It consists of many Khmer and Cham households whose main activities are agriculture and fishing. The best way to explore it is by bike (although you could do it by foot if you give yourself enough time). Cycle through the village, past hidden pagodas and vibrant paddy fields.The locals smile as they go about their daily business and the friendly children will call ‘Hello’ after you or hi-five you as you cycle past. 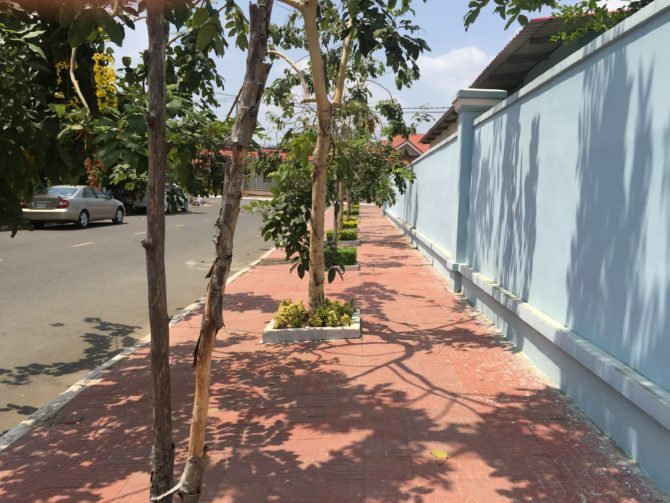 Most of the roads are concrete and lined with attractive wooden stilt houses, vegetable gardens, and fruit trees. Jackfruit, bananas, pineapple, pomelo, mangoes, coconuts, you name it! Many of the families set up little stalls outside selling some of their produce. 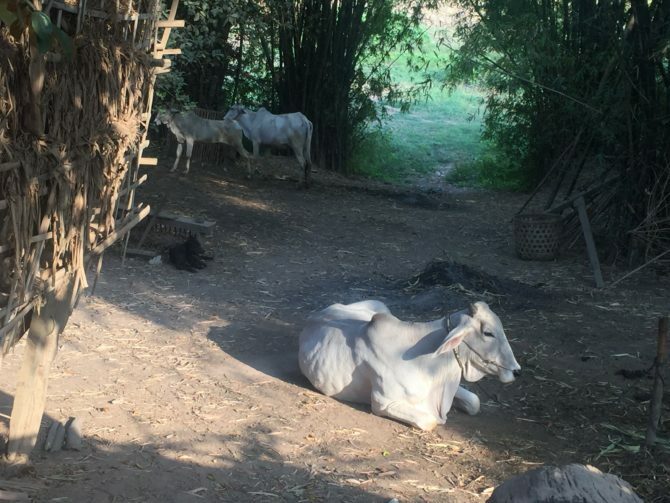 Nearly all the households have some kind of poultry or livestock, so cows, buffaloes, chickens, cats and dogs wander about freely, and an occasional horse and cart passes by. 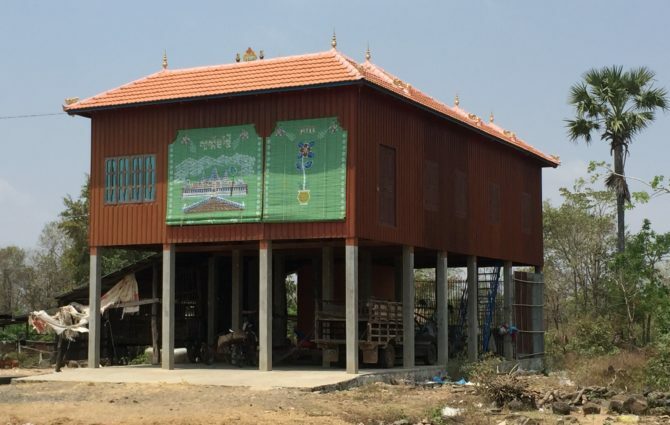 About 3.5 km outside of Kampong Cham is Wat Nokor Bachey. It’s still relatively unknown to tourists and consists of a more modern pagoda built within the walls of an Angkorian temple. Entry is $2 USD (£1.60 GBP), but this also covers entry to Phnom Pros, Phnom Srey and Wat Hanchey which is pretty good. The central working pagoda displays beautiful, colourful Buddhist murals, painted pillars, and tiled floors. If you enter you’ll likely find nuns or monks in the shady interior sheltering from the heat of the day. You should also be able to receive a water blessing from one of the monks if you wish. 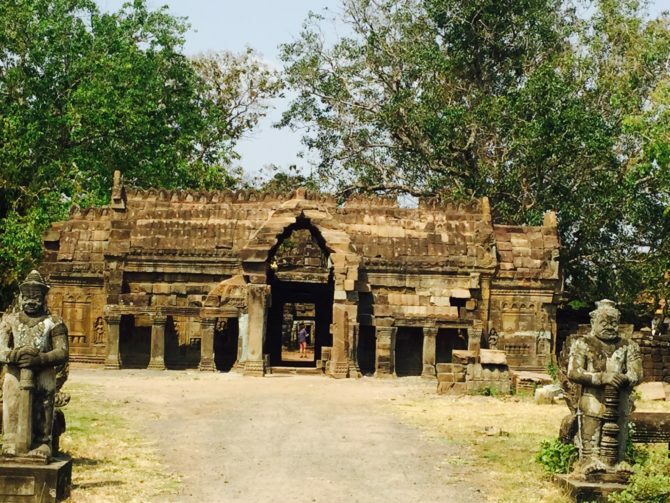 Scattered around the grounds are other Angkorian structures, alongside a more recently built Chinese cemetery and other working pagoda buildings. A collaboration with French NGO Amica, this community-based ecotourism project is set in Cheung Kok Village, one of the most attractive Cambodian villages I’ve seen. Tidy, wooden stilted houses line the streets with pretty, colourfully painted wooden blinds hanging at the glass-less windows. Chickens, cats, dogs, cows and buffaloes wander in and out of the gardens and smiling, cheeky children call after you as you cycle by. Scattered around the village are signs telling you about, and where to find the various tradesmen (and women). Things like palm sugar producing, silk making, palm weaving, rice cultivating and pig breeding are all carried out by the villagers. I loved the fact that under many of the houses lived a massive pig. Translated, Phnom Pros and Phnom Srey means man hill and woman hill. These and their pagodas are located about 8km outside of Kampong Cham, past Wat Nokor and surrounded by the ‘Killing Fields’ of Kampong Cham. It’s very scenic but knowing the background is always on your mind. Entry to both sites is included in the entry fee for Wat Nokor, and a combination of all three sites make for a nice half day cycle trip or shorter motorcycle trip. By the time I arrived at the entrance to the two hills I’d already cycled about 24 km on my own little mystery tour around rural Cambodia. 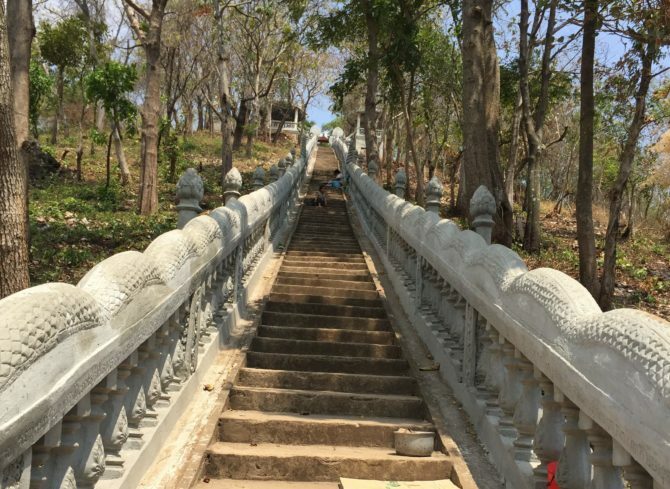 Hot, sweaty and exhausted, I walked and wheeled my bike up the slight incline to the light coloured, ornate pagoda (with three tall temples) at the top of the lowest hill – Phnom Pros. The pagoda here is much more attractive than that on Phnom Srey and worth a wander around. At the back there are also a few small local drinks stalls where you can buy a much-needed refreshment. Just be careful to wipe the tops of any cans or bottles well before drinking…my can of coke was filthy! Phnom Srey faces Phnom Pros and can be reached via taking the road that forks to the right just before Phnom Pros. Phnom Srey is much higher than Phnom Pros (308 steps to the top). The many legends suggest this is because the men and women of the town had a competition to see who could build the highest hill, the women were losing but being more cunning, tricked the men and so, in the end, the women won the competition! Phnom Srey is pretty shabby and in a state of disrepair in comparison to Phnom Pros. It’s also quite a traipse to the top of the steps and in all honesty (especially after my hot bike-ride) I’m not sure it was worth it. There’s not much to speak of at the top, except for a small, nondescript temple, and of course the view of the countryside, although that’s partially obscured by trees. Again around the foot of the steps are a few local stalls selling snacks and drinks. In the grounds between the two hills are a new wat, a Chinese cemetery and a garden with a big Bayon-like head. 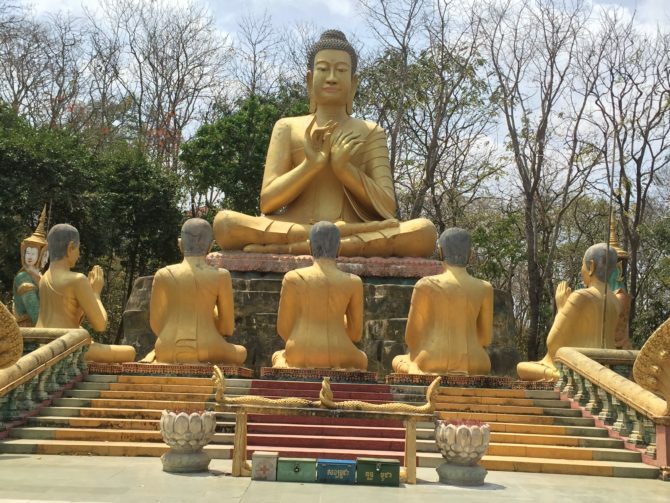 There are several large gold Buddha statues (including a reclining one), and lots of Apsara dancer statues. The place was also completely overrun by monkeys, so watch your food and drinks. One monkey jumped into a tuk-tuk and stole lunch from the only other tourist that there. Another took a fancy to my water and pinched the bottle out of my bicycle basket when my back was turned. It swiftly opened it and downed the water – cheeky monkey! Rabies is also present in SEA, so don’t get too close to the monkeys, no matter how cute they look, they can and do bite! Mekong Crossing – situated on a corner on the riverside road, this restaurant serves a good selection of Khmer, Asian and Western food and they’re well known for their homemade crumpets. I ate here twice and had the delicious, flavourful Plea Sach Kor – beef salad, only $3 USD (2.40 GBP), and Yellow Vegetable Khmer Curry, only $2.50 USD (2 GBP). The staff are all exceptionally friendly, and speak very good English and even complimented my (terrible) Khmer…all five words of it. Lazy Mekong Daze – a great spot for people watching, this restaurant serves Khmer, Thai, French and Italian food, including great thin crust pizzas. I had a vegetable pizza with extra mushrooms which at $7 USD (5.60) isn’t cheap, but if you’re craving cheese and mushrooms like I was it’s worth it! Smile – a training restaurant for disadvantaged youngsters, popular with expats, especially for their breakfasts. They have a good selection of dishes and the friendly staff speak good English, however, they were a little slow at serving. I had a very tasty Prawn Tom Yum Soup with rice for $3.80 USD (3 GBP). There weren’t any specific bars that I could see, but any of the guesthouses and restaurants serve drinks. If you fancy something a little more up-market with a view, ‘Sky Bar’ on the breezy eleventh floor of LBN Asian Hotel overlooks the town and the Mekong River and serve a selection of nice cocktails. Don’t forget of course to give the local food stalls near the bamboo bridge a look and maybe taste some local delicacies, such as snails, boiled fertilized chicken embryo, all manner of BBQ’d meats including whole chickens and ducks and of course huge green coconuts. I was hosted for a two-night stay with Reasmey Cheanich Hotel, which I’ve reviewed below along with another couple of suggestions. Read more in our full Product Review Disclosure. Reasmey Cheanich Hotel is a fairly new (three years old) boutique hotel a few streets back from the riverside. From about $15 USD (£12 GBP) a night per room I would class this a mid-range hotel (for Cambodia). It’s well located (a short distance from the slightly noisier water-front and night market area) and is a well-presented hotel. The reception was clean and bright and myself and the two guests in front of me received a warm welcome from the receptionists, including maps of the area and suggestions on what to do, where to go and best places to eat and drink. I was lucky enough to stay in their superior room, which had its own balcony with coffee table, chairs, and plants, plus what appeared to be a massive stone bath tub. I assume you could fill and relax in it should you wish. The bedroom was clean and tidy, with a double bed, big screen TV and air-conditioning. There was also a mini-fridge, a kettle, coffee, and teapot (although strangely no tea). The bathroom was also clean and toiletries provided. The second night I stayed in a standard double room, which had the same standard of cleanliness and tidiness was the same as the first. The only difference was the room was smaller, there was no balcony and a slightly smaller TV. One thing to be aware of is that the hotel doesn’t have a restaurant as such, just a small cafe that serves breakfast at an additional charge. This isn’t an issue though as there are plenty of restaurants and cafes on along the riverside road. If you do decide to eat breakfast in the hotel, be sure to check they have all the ingredients before ordering, especially if there are only a few guests. The ladies on reception were very helpful throughout my stay and arranged cycle hire for me. You can also rent motorcycles and there’s a garage where I’m sure you could store your own motorbike or scooter during your stay. Other places to stay include the budget centrally located Mekong Hotel which has rooms from $8 USD (£6.50 GBP) a night and the recently opened big LBN Asian Hotel, which has rooms from $32 USD (£26 GBP) a night. 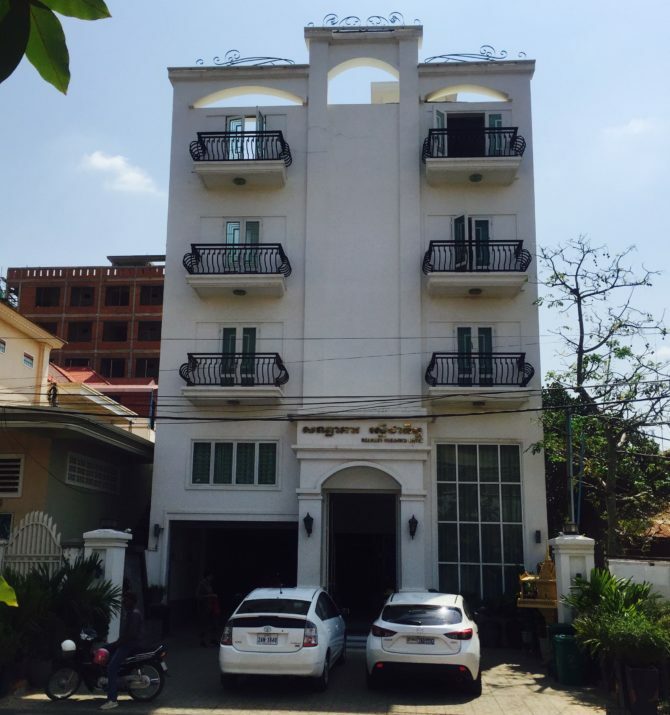 The LBN Asian Hotel is probably the newest and nicest hotel in Kampong Cham and the nearest you’ll get to luxury accommodation there. There are several options to get to Kampong Cham which vary depending on where you start from and for getting around whilst you’re there. Bus companies and schedules seem to change all the time too, so only take the below as a rough guide, be sure to double check before making any solid plans. We always try to book our tickets online through Cambo Ticket where possible. Siem Reap – there are direct buses from Siem Reap, although the correct bus companies and schedules aren’t common knowledge. After much searching, a travel agency on a corner off Wat Bo Road helped me. They called around and booked me on a bus leaving at 7 am. It cost around $10 USD (£8 GBP) and took about five and a half hours to get to Kampong Cham including a 20-minute food and comfort break. Alternatively, you could get one of the many buses that run from Siem Reap to Phnom Penh, taking about six hours and costing between $8 – $16 USD (£6.50 – £13 GBP). You then need to catch a bus or mini-van to Kampong Cham (see below). This is quite a detour though and likely to take the best part of a day. The other option is a private taxi costing significantly more than a bus. If there are several of you to share the cost though it would be a good option as it only takes about three hours. Phnom Penh – There are several buses running to Kampong Cham from Phnom Penh, they take around three hours and cost about $5 USD (£4 GBP). A taxi costs about $40 USD (£32 GBP) and takes about two hours or just $50 USD return if you feel like doing it in a long day trip and you may be able to negotiate cheaper than this. If you’re returning to the same place you started you can expect roughly the same transport options and places. Other places you could head after Kampong Cham include Kratie (a four hour, $5 USD (£4 GBP) bus journey) and Sen Monorom in Mondulkiri (about a five hour, $10 USD (£8 GBP) bus journey). If you have a different starting point, are heading somewhere different, or need more details just ask at your hotel, guesthouse, a local travel agency or bus station. 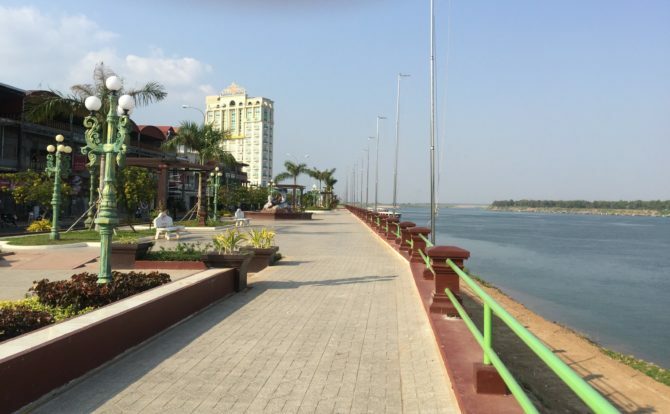 Kampong Cham town itself is quite small and you can easily get about on foot, however, if you’d like to go further afield there are several options. A bicycle or motorcycle can be rented via most guesthouses and hotels from $2 – $4 USD (£1.60 – £3.20 GBP) or $5 – $8 USD (£4 – £6.40 GBP) respectively, a day. Alternatively, you could find a tuk tuk on the street or have your hotel or guesthouse arrange one for you. Moto-taxis and regular taxis can also be arranged. Wat Dei Doh – set back from the southern end of the riverside road, opposite the Koh Paen Bamboo Bridge this is a colourful pagoda with Buddha statues and temples scattered all over. The Wet Market – the light yellow dome in the middle of town is host to a multitude of stalls selling all kinds of freshwater fish and shellfish, including giant snails from the paddy fields, a specialty of the area. The Night Market – on the corner at the far end of town is a sprawling night market, selling everything from mattresses, to clothes and shoes, to cleaning products, to local food and drinks. It’s heaving with locals every night and seems to be the place to be. Wat Joy T’maw – overlooks the Mekong at the northern end of the riverside road and has colourful wall paintings and intricate patterns and sculptures. Wat Hancheay – this pagoda is a bit further afield, about 20 km away from Kampong Cham. It’s the home to some young monks and it’s location atop of a high hill offers stunning views of the surrounding countryside. If you get the chance, it’s worth spending at least a couple of days here. Relax, enjoy the peaceful atmosphere and slow pace of life, and explore the town and surrounding sites. It’s a refreshing change from busy city life and allows you to recharge your batteries in calm picturesque surroundings. Have you visited Kampong Cham? Have I missed anything off the beaten track there is to see there? Product Review Disclosure: Reasmey Cheanich Hotel provided me with a complimentary two-night stay. This did not influence my post in any way and as always I’ve provided a balanced and honest review. There’s a village about 2km from the bridge (down the road with the water tower) with a homestay and an NGO to help the kids learn English and get into hospitality work. It’s one of the most beautiful and special places I have ever been. What a great post! 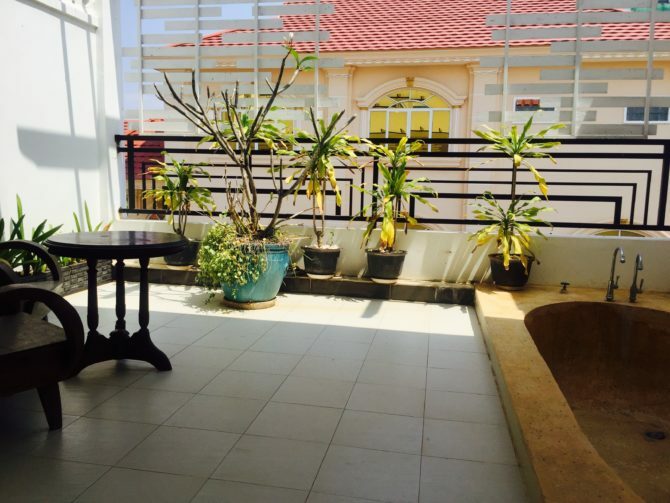 The homestay sounds amazing – if I have time whilst I’m here in Cambodia I may go and give it a look!